As usual, Nokia has taken great care to add as much additional value to the Lumia Windows Phones as possible given the constraints imposed by Microsoft. And since Microsoft doesn't really allow UI customizations, adding value translates to supplying exclusive apps and services. Here is a quick demo video to get you started. The Nokia Lumia 625 comes with the Amber update preinstalled but that doesn't change the user experience dramatically. It does add a few features like FM radio support and a new camera lens (more on that in a minute) but the rest is barely different from the previous WP8 iterations. Oddly, the Lumia 625 doesn't come with the so-called Glance Screen available with the Amber update that shows the clock and some notifications, while the phone is locked. The lockscreen displays the current time and date and shows calendar events, emails and missed calls. Being a WP8 handset, the Nokia Lumia 625 also supports voice commands - you can dictate or have the phone read text out, you can initiate searches and so on. Unfortunately, the Windows assistant is still far behind the competition as far as recognition speed and accuracy are concerned. Luckily Microsoft is working on Cortana virtual assistant that should premiere with WP8.1 in the US in early 2014 and the rest of the world in 44 languages before 2014 ends. The Lumia 625 also comes with the Data Sense app, which shows you the amount of data you've used. Both cellular and Wi-Fi traffic is accounted for. There are different data limit types: one-time, monthly and unlimited. The first two accept custom bandwidth limit values, while the latter is applicable if you have an unlimited data plan, but would still like to track your usage. The Data Sense can also restrict the background data usage for all apps, provided you're near the data limit that's been previously set. This will prevent some apps from functioning properly, though. The new Nokia Lumia 625 features the nicely helpful Kid's corner. You can select the apps and the types of media content that goes in and password-protect it, so you can safely share your smartphone with your kids without worrying that they will mess up your settings or access inappropriate content. When activated, the Kids corner is accessible by swiping left of the lockscreen. If you've secured it, your kids won't be able to return to your standard lock and home screen without the password. 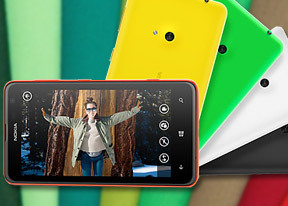 The Nokia Lumia 625 uses the Qualcomm MSM8930 chipset (1.2GHz dual-core CPU, 512MB RAM and Adreno 305 GPU). That's as good as it gets for the mid-range WP8 devices at this stage, though it is enough to give you a hiccups free performance. A good thing is, the WP8 platform doesn't feel sluggish at all. Navigation is fast and animations are nicely smooth and fluid. Loading times aren't always perfect, but are never too long to be an annoyance.